This instructive 3 day ELSO Endorsed course is designed for physicians and specialists caring for patients who recieve Extracorporeal Life Support. 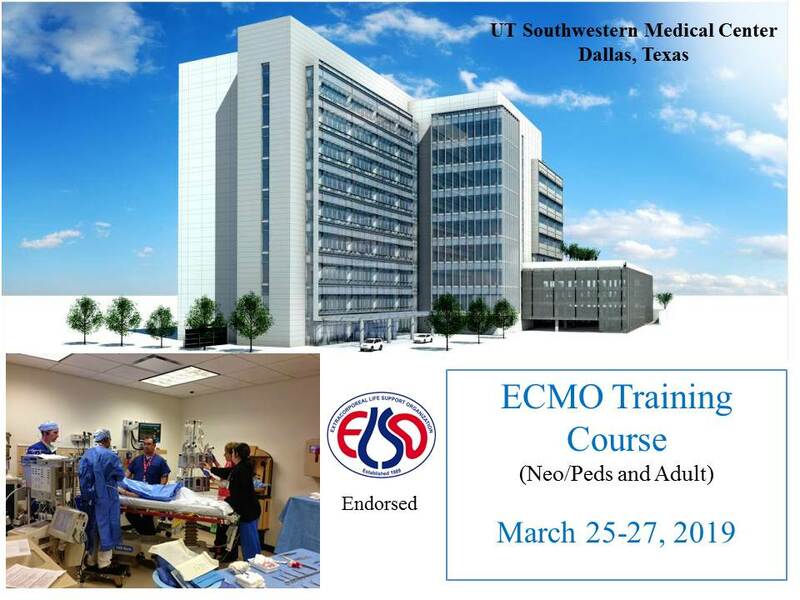 Course content will include ECMO indications and contraindications, ECMO patient and circuit physiology, cannulation techniques, anticoagulation and other aspects of ECMO patient care and management. The course will spend equal time between didactics and small group simulation (hands-on and fundamentals review). The course will utilize clinical case scenarios; faculty and educator guidance and technological resources to facilitate team training and clinical critical thinking and decision making. This instructive 3 day ELSO Endorsed course is designed for physicians and other healthcare professionals caring for patients who recieve Extracorporeal Life Support. ON-LINE REGISTRATION IS NOW CLOSED FOR THIS COURSE. IF YOU HAVE QUESTIONS OR CONCERNS, PLEASE E-MAIL OUR OFFICE AT CMEREGISTRATIONS@UTSOUTHWESTERN.EDU. Turn right at the first traffic light after crossing under Harry Hines. After you go underneath Harry Hines Blvd., take the first right turn into West Campus Building 3. From the front door entrance, you will see elevators on your right. Take the elevators to the Simulation Center on the 3rd Floor. The University of Texas Southwestern Medical Center designates this live activity for a maximum of 19.25 AMA PRA Category 1 Credit(s)TM. Physicians should only claim credit commensurate with the extent of their participation in the activity. The presentations titled, “Ethics and Economics” and "Patient Selection" have been designated by The University of Texas Southwestern Medical Center for 1.0 credit hour in medical ethics and/or professional responsibility. "Login" to your existing account or create an account in EthosCE, online learning management system, by selecting the "create an account" link. On this course page click the "add to cart" button.